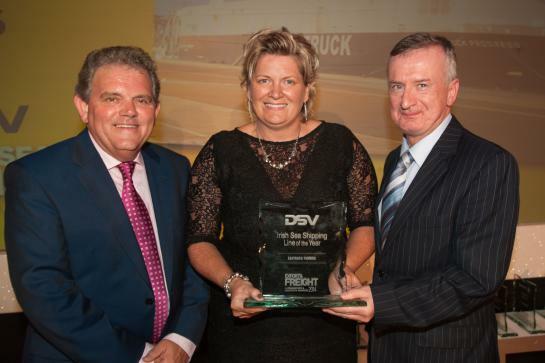 The company was presented with the much coveted award, sponsored by DSV, at a glittering ceremony at the Ramada Hotel in Belfast. Each of a carefully selected group of hauliers, asked to anonymously pick one service which offered the optimum level of service, quality, on-board facilities and choice of routes, registered their votes via a totally secure and carefully policed on-line ‘one customer one vote’ system, with Seatruck Ferries again topping the poll. It’s been a busy year for the ferry company. Among developments, underlining its continued commitment to its customers, was the replacing in April of the "Arrow", which was operating on the Dublin - Heysham route, by a much larger Seatruck "P" series vessel. As well as bringing speed, schedule reliability and additional capacity, the change confirmed Seatruck's long term commitment and strategic importance to the route. Meanwhile, after listening to customer feedback Seatruck also opted to refit all passenger twin berth cabins on both FSG vessels operating on the Dublin - Liverpool route. Passengers travelling on both the “Seatruck Power” and the “Seatruck Progress” now have the added convenience of two single beds on ground level. No longer will drivers have to climb to share a bunk bed facility. With 16 separate categories, the annual Awards is organised by the Hillsborough based publishers of Export & Freight magazine, 4SM (NI) Ltd, and is now widely regarded as the premier event in the Irish Transport & Logistics calendar, attracting entries, support and sponsorship from all the leading players in the industry.